Each type of material follows a slightly different process for development. Once materials are developed in draft form, they are then pretested, finalized, produced and disseminated as part of the SBCC campaign. This guide provides general steps for developing materials and draws on results from the message design and channel mix guides. In-depth guidance for specific types of materials can be found in the Resources section. There are many ways to categorize communication materials and creative outputs, and the growth of electronic media means there is more overlap among the categories than ever. For example, brochures, music, movies and discussions can all be accessed digitally, and various materials can be used in interpersonal communication. What’s important is to identify the mix of materials, media and formats that will best influence the priority audience. This table provides several types of material to consider. Programs use creative outputs—materials—to communicate with audiences and influence behavior change. Well-designed materials with tailored messages have the potential to impact social norms and behaviors that lead to a healthier society. Following a structured process for materials design helps ensure that program outputs are audience-focused and compelling, which ultimately increases their effectiveness. A small team of SBCC professionals and program staff typically work with one or more creative and technical professionals. Depending on the media and materials chosen, these professionals may include an artist, scriptwriter, design firm, advertising/public relations agency, media production company, digital media designers or others, as appropriate. SBCC materials can be developed within or outside a materials development workshop. Programs might opt to address message design, channel planning and other aspects of SBCC programming in a single workshop. When Should SBCC Materials Be Developed? Develop materials after designing messages and determining the channel mix. Developing materials can take any period of time, from one week to a few months. Consider the size and efficiency of the creative team available to develop materials, how many materials need to be developed and the complexity of the topic. Generally speaking, longer and more complex materials take longer to develop than short, simple materials. If working with an advertising or creative agency, request bids from at least three and ask that proposals include timelines, in addition to the specific steps, approvals, products and budget. Before engaging creative professionals and others in the materials development process, collect and review existing materials on the topic and related topics, as well as those created for the primary audience. If possible, obtain information, such as evaluation results, on how audiences responded to those materials and any impact the materials had. To locate existing materials, the team can scan the Internet using web search engines, and visit specific organization websites or SBCC resource sites [including Springboard, Health COMpass, K4Health, Comminit, Communication for Development and others]. The team can also reach out directly to partner organizations and SBCC technical working groups. Identify which materials can be used without making any changes, which can be adapted, what is missing and the mistakes to avoid. Consult the adaptation guide for assistance with adapting existing materials. The message to be conveyed. For example, complex or controversial messages require longer and/or more interactive formats (radio/TV programs with call-in segments, structured IPC activities) than simple messages do. The barrier being addressed. For example, addressing self-efficacy barriers is best done through formats that allow participants to practice new skills. The channel selected. For example, which messages can be effectively conveyed in a community drama attended by people of all ages and genders? Frequency with which the message should be seen. For example, it will be helpful to convey simple messages that benefit from a lot of repetition on billboards, posters, radio spots and household items. For this step, complete a table to align audiences, messages, channels and materials. This will help the team determine what materials should be developed. Planning your family can help you and your family members achieve a brighter future. Make Family Planning a regular part of your life. Family Planning is good, effective, safe, and acceptable. Helps the family manage its available resources so the children can grow healthy and be well-educated. Helps the father, mother and child to stay healthy. For each material identified in step 2, complete a materials development worksheet (see Template 1: Materials Development Worksheet). Transfer key messages developed during the message design phase to the first column of the materials development worksheet. Note that the message is not necessarily the words that will be used in the material, but the main idea that will be conveyed. Messages may be communicated in many ways in a material, including through the text/words, audio, images (pictures, graphics, video), tone and/or action. For each message, add proposed content to the table. Use the completed worksheet to create the draft material (Step 6). Image: Briefly describe the image that will support the message. This might be a drawing, photo or other graphic. Actions: Describe the actions that should be shown in the visual, heard in the audio or serve as instructions for artists/directors/producers. Working with a professional creative agency can be especially helpful during this stage, due to their experience and creative insights. Prepare ORS when a child has diarrhea. Young child with diarrhea. Mother emptying ORS packet into a one-liter container. Mother: I am making this ORS for you to help you feel better. Don’t worry, you will feel better soon. Mother empties package, stirs solution and gives the child a reassuring look. The child should continue to drink, be breastfed or eat soft foods. Father feeding the child porridge; bowl on the table with a banana and egg. Father: It is good to see you eating, my child. I know you must be hungry! While father feeds the child, the mother is in the background preparing supper for the rest of the family. Any ORS not given to the child within 24 hours should be thrown away. Mother pouring ORS solution down drain. Child lying on father’s lap. Lamp on table. Mother: Time to make her some more ORS – this one has been sitting since yesterday. Local music playing softly in background, as if from radio. Mother takes pitcher from table to sink, empties it and begins making more solution. Ensure that the program or creative agency (if applicable) has the hardware and software needed to produce the materials per the agreement. Programs producing their own materials might need a computer, camera, video camera, audio recorder, microphone, smartphone or other hardware. The right software and applications are just as important and might include Word/Write, Photoshop, Illustrator, PowerPoint/Keynote presentation apps, Quicktime/iMovie, Sound Recorder/Garageband, YouTube, Twitter and others, depending on the medium and platform. Be sure to investigate what apps/software work on the platforms the program will use. Attract and hold the audience’s attention. Use colors, images, key words and design elements that make the material stand out so that it is noticed and memorable. Ensure the material conveys the message clearly, with easy-to-understand words and images. Stress how the audience will benefit from adopting the new behavior. Ensure that content within and among materials does not conflict. Repeat messages throughout the materials. Re-use the same words and phrases, as appropriate. Also, re-use the same or related images and styles. This avoids confusion and repetition enhances the impact of the message. Well-developed materials encourage the audience to trust the organization or program using them. Trust and credibility allow and encourage the audience to heed the message. People are swayed by both facts and emotions. Use both to maximize the material’s persuasiveness. Include a clear call to action in materials. Tell audience members precisely what they can do. 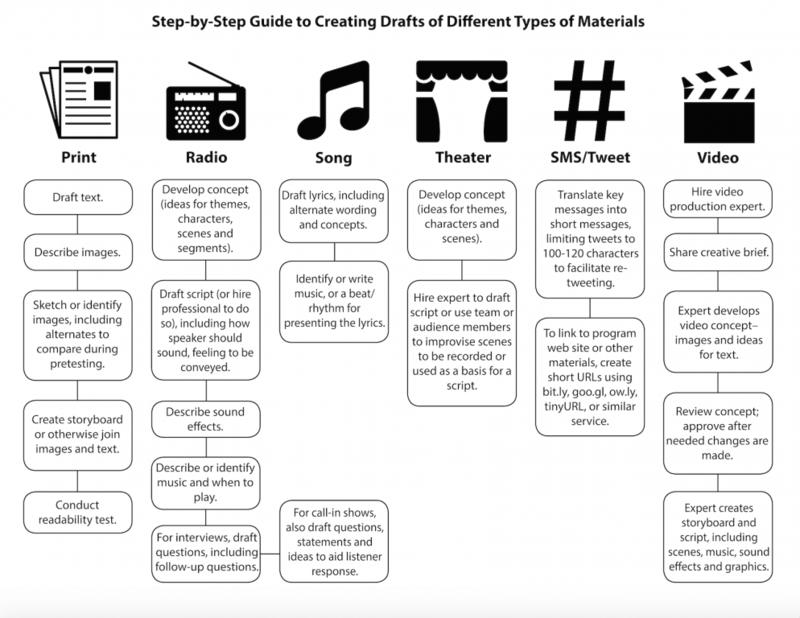 Use the flowchart below as a guide to create drafts of different types of materials. In addition to materials, programs might want to develop and test concepts, themes, slogans, tag lines, for use in and across SBCC materials and activities. See Resources for more detailed guidelines on creating various types of materials. Before preparing the materials for pretesting, have a topic expert review them (for example, if the topic is malaria prevention, ask a malaria expert review the content). Implementing partners, collaborating agencies or other gatekeepers, such as Ministry staff, donors, and community leaders, might also need to review the drafts to ensure nothing is contrary to their policies or recommendations. Program staff might need to mediate between the need for precision, the need to satisfy gatekeepers and the need for audiences to understand and relate to the concept. This step might have to be repeated after pretesting. If not already developed in the language of the audience, have staff or a professional translator translate the material into the main language(s) used by the audience(s). Whenever possible, have a different person translate the translation back into the original language before pretesting in order to check the accuracy and nuances of the translation. Materials should be pretested in their draft form. See the pretesting guide for guidance on pretesting draft materials and making revisions based on pretest results. After pretesting and making revisions, produce the final materials. Final production can be done in-house or by hiring company or consultant, depending on the material, budget and program capabilities. In cases where creative agencies or professionals are hired, they should be involved at every stage, starting from the initial creative design, and through the production stage. Use professionals for the highest quality print, radio and video materials. Use an experienced web/IT person/professional to upload files to the Internet and register URLs. Work closely with whoever is producing the materials to ensure that the materials match the requirements in the creative brief and are produced on time and within budget. Review proofs (what the printer will use to print multiple copies) and rough-cuts. Beta test anything that will be accessed by phone, tablet or computer—ask potential users to access it on their own phone, tablet or computer. See Resources for links to production tips for various types of SBCC materials. If possible, use a variety of materials to appeal to audience segments at different times and in different ways. Avoid clutter—any visual, aural and textual information that does not add meaning and could distract audience members from the message. Ensure that the different content elements reinforce one other. Instead of jargon, use simple language that the audience will understand and be able to re-use. Convey the message as concisely as possible, but also using only the words and images that are truly necessary. Respect the audience. Avoid talking down to the audience or using authoritarian language/tone. Generally speaking, all of the materials in an SBCC effort or campaign should have consistent messaging, tone, feel, style, imagery, wording and approach. They should reinforce each other and any one material should remind the audience of the other materials in the effort. Expand reach and access by including web links, telephone numbers and SMS/text codes where users can get additional information or otherwise interact with the health program. Do not assume that low-literate audiences (and even others) understand symbols the way the project staff does. Common mistakes include using stop signs in materials for people who are not familiar with stop signs and x to mean “do not”. The overall process of materials development should be the same, whether for IPC, community or mass media outputs. Developing activity guides, curricula, counseling algorithms and community event scripts requires following the same process as the one used for developing a TV spot, for example. IPC and community materials should adhere just as closely to the communication strategy and creative brief. Following a structured materials development process helps ensure that the material are well-received by the priority audience, as well as those who influence whether and how they receive the materials. Comprehensive planning is key. Ensure that the resources—human, technical, financial, time and material—are available to produce the quality, quantity and distribution of materials needed to effect change. While hiring a creative agency might seem expensive, it can often save time and money in the long run and result in more effective materials. While audiences like and need to see themselves in materials, sometimes they like to see others in the materials as well, so they do not feel that the problem or behavior applies only to them. B-roll is the video footage developed by programs for use by news media (who usually use just a small amount of the footage in their story). A beta test is the final test of a computer application before releasing it for public access. It gives access to the hopefully final product to a limited, but representative, number of people likely to use the application—giving them time to use it, identify glitches and provide feedback on usability (and other factors, as determined by staff). The channel or medium is the means by which information is communicated. E-zine is a web-based magazine. Media mix is the combination of channels used to maximize the reach and effectiveness of SBCC efforts. Readability is an assessment of the education level needed to understand a text. SMOG is one test that does not require a computer or Internet so it can be used in any setting. Other tests are available online and in programs, such as MS Word (under Spelling and Grammar, check “Check grammar,” then choose “Options,” find “Grammar,” and check “Show readability statistics”). Rough-cut is a video or audio presentation that has not undergone a final edit; it gives an idea of what the final product could be. Immunization and Child Health Materials Development Guide, PATH, 2001. Creating Materials and Messages for Change, K4Health. mHealth Field Guide for Newborn Health, Core Group, 2014.